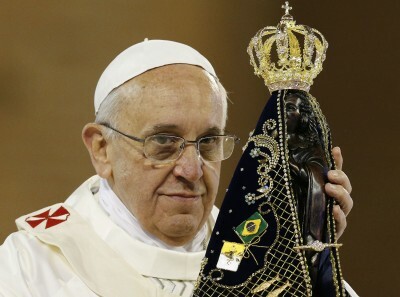 APARECIDA, Brazil (CNS) — Comfortable in the presence of Mary and at a shrine that symbolizes one of his most important experiences as a member of the Latin American bishops’ council, Pope Francis kicked off five days of intense activity with an act of devotion. Visiting the Basilica of the National Shrine of Our Lady of Aparecida July 24, the pope entrusted World Youth Day to Mary’s maternal protection, but also challenged parents, priests and other adult Catholics to give the young people things that the world, with all its wealth, cannot: faith and values. The pope began his homily during Mass at the world’s largest Marian shrine by recalling the month he spent in Aparecida in 2007 as part of the Latin American bishops’ council, CELAM, and his role as head of the committee that drafted the gathering’s final document on evangelizing the continent anew. Pope Francis said the thousands of lay Catholics who continued to come to the shrine each day to pay homage to Mary and ask her help during the meeting served as a witness to the bishops and helped them with their work. 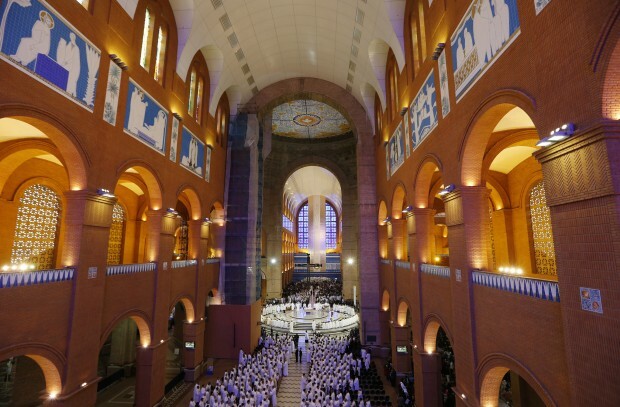 “The Aparecida document was born of this interplay between the labors of the bishops and the simple faith of the pilgrims,” he said. Tens of thousands of pilgrims had gathered in the rain outside the shrine, hoping for a glimpse of the pope, who traveled most of the way by plane instead of helicopter because of the weather. As soon as the pope arrived, he greeted the superior of the Redemptorist community that staffs the shrine, then he got into the popemobile to greet the crowd and kiss babies. Pope Francis asked Mary to aid him in fulfilling his responsibilities as pope and formally entrusted to her the hundreds of thousands of young people from around the world who were gathering in Rio for World Youth Day. Hope is one key to that future, he said, even in the face of difficulties and the reality of evil. While it is tempting to be pessimistic and worry that faith cannot possibly compete with the flashy attractions of the world, the pope told the people that they must be confident, trusting in God and in the goodness that lies in each human heart. “Let us encourage the generosity which is typical of the young and help them to work actively in building a better world,” he said. The Gospel reading at Mass was the story of the wedding feast at Cana, where Jesus turned water into the finest of wine. Finally, the pope said, Christians must be people of joy, who share their happiness and confidence with others.